Our clients live in New Mexico and use this loft as a pied-a-terre when visiting New York City for cultural events. Our design gives them the flexibility to entertain and accommodate weekend visitors in a very compact volume of space. The original utilitarian zones along the rear façade – bathroom, kitchen and laundry – were reassembled in a more efficient way to emphasize a sense of spaciousness from the front of the apartment to the back. Stainless steel tubes and structural timber above the new kitchen support a sleeping platform. We minimized the depth of the structure in order to maximize head room in the habitable spaces above and below the platform. Lighting fixtures are imbedded between the pairs of tubes and illuminate both the upper and lower levels. 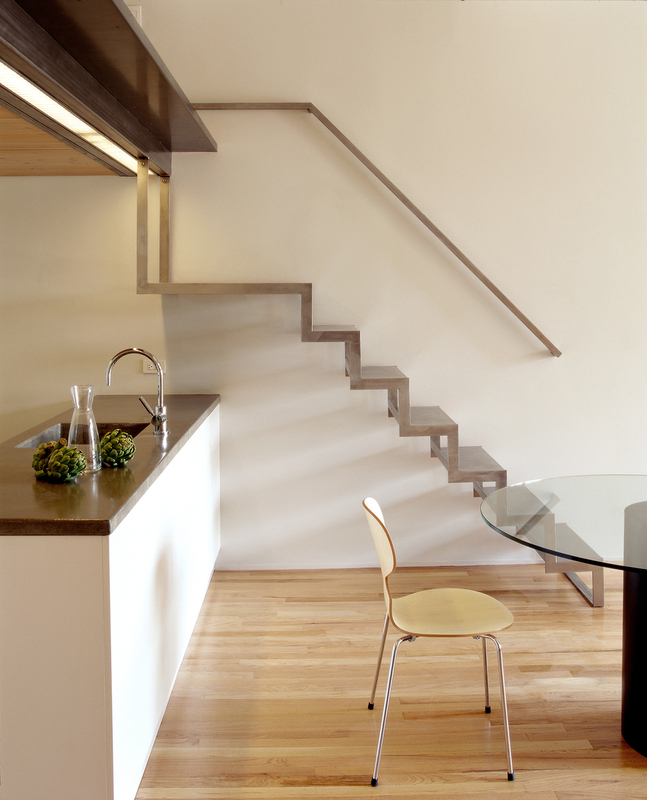 The skeletal stair structure hangs from the platform and provides a sculptural backdrop for the dining area. A tall lacquered fiberboard cabinet delineates the owner’s bedroom area from the main living areas. Recessed cove lighting integrated into the top of the cabinet washes the entire ceiling with a warm glow, accentuating the height of the space. The new bathroom is veiled in translucent glass and provides additional lighting to the entryway. Inside, the bathroom is sheathed in smooth hand-waxed stucco and cast-concrete tiles to create a monolithic waterproof shell. The concrete, chosen for its texture and color, is also repeated in the kitchen counter.